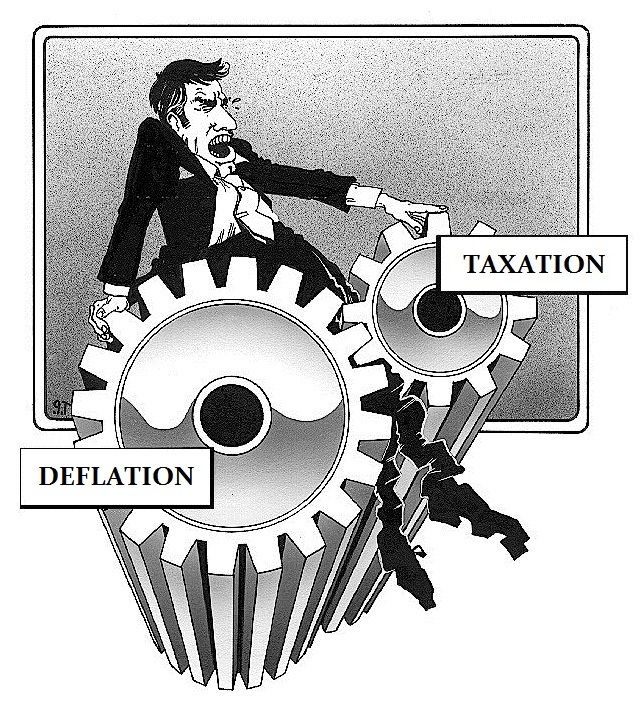 Deflation – What is the Cause? PUBLIC or PRIVATE? You talk quite a bit about deflation in your comments, especially in Europe. Can I assume you’re referring to monetary deflation arising from a slowdown in the velocity of money? Which I’m guessing stems from banks using the plentiful money that’s available to them to purchase government bonds, using 30-1 leverage (as instructed by the central banks) and trading with most of the rest. I ask about the type of deflation to which you refer because surely you’re not talking about their cost of living going down, as it’s rising in Europe, the UK and the US. If you agree, why the disconnect? 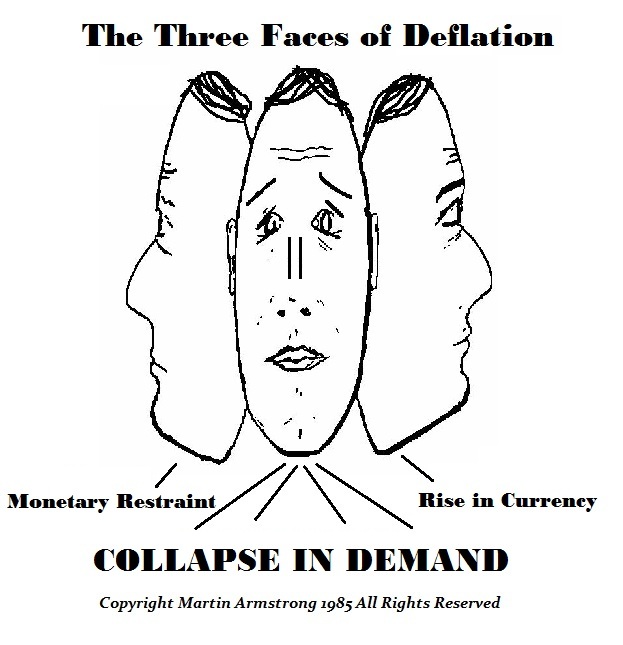 Why does monetary deflation still result in a higher cost of living? Appreciate all your great work over the years. ANSWER: There are always different flavors of inflation and deflation. There can be currency inflation where the price of everything rises because the currency declines in international purchasing value, which has nothing to do with supply and demand per se other than a sharp decline in currency value corresponds to a rise in price that will impact demand eventually. Here the type of deflation that exists to some extent is in prices, but this is really a side effect. Some prices are declining marginally as people cut profits to try to do some business. This accounts for the decline in cost of living in some areas that are marginal like 0.4% for a quarter that is unnoticeable as a whole. It is the decline in the VELOCITY of money as banks lend less to the private sector without 110% security and buy more bonds. The disconnect has to do with the source of the cause – PUBLIC v PRIVATE. You also get DEFLATION when the rise in the cost of living is not from the private sector but from the public sector. Government consumes more and more of the disposable income and therefore people have less to spend and that will also cause prices to decline to try to stimulate business – albeit marginally. This also results in higher unemployment, decline in job creation, and a rise in business closures as well as bankruptcies. When the cause emerges from government with rising taxes, people experience a DECLINE in their standard of living. So even if prices rise because costs are rising, it is still DEFLATIONARY for the economic growth is absent and the VELOCITY declines. Inflation results when there is a rise in DEMAND because people are buying rather than just surviving. DEFLATION that comes from a cut back in spending that results in hoarding of cash unfolds when CONFIDENCE in the future crashes. The money is there – people just do not spend. This is the presumption that is the single-minded cause in central banks policy. They constantly fight ONLY this type of DEFLATION and never consider that the cause is something other than a mere collapse in CONFIDENCE – it is a rise in the cost of living coming from taxes that is causing a drop in disposable income as distinguished from hoarding. Central Banks never look at the other-side of the DEFLATIONARY coin.